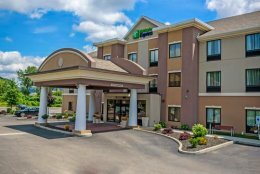 Enjoy staying along Route 219 just across the state line between Pennsylvania and New York in the City of Bradford close to a wide range of activities in the Allegheny National Forest, the Allegany State Park, the Zippo/Case Museum, the Seneca Allegany Casino and Holiday Valley Ski Resort. 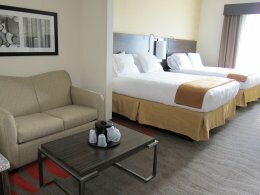 Newly opened hotel offers the amenities you desire; 75 deluxe-appointed guest rooms, indoor pool, cable TV with premium channels, in-room refrigerators & microwaves in suite rooms, optional whirlpool suites, complimentary high-speed wireless Internet, complimentary breakfast bar and business center. Walking distance to a variety of restaurants and shops. Late check out for IHG Rewards members. On site conference room accommodates up to 50 people. Free parking. Parking lot can accommodate ATV & snowmobile trailers. Directions: South-bound Rt. 219 – take the Forman Street Exit, turn right, entrance to the hotel is directly to your right. North-bound Rt. 219 – take the Elm Street exit, at the bottom of the ramp turn left go under the underpass and turn right, go to first light (intersection with Main Street) go straight. At first stop sign, bare to the right, proceed and you will see the hotel sign to the left with the entrance to hotel parking.